The 2017 financial results have been published for the popular sandwich chain Pret a Manger, commonly known as Pret, and it demonstrated that due to the fact that the company strives to meet consumer demands, the direction appears to be encouragingly plant-based. During 2017, Pret continued their trend of using social media to get in touch with the public to obtain consumer feedback. In response to growing interest in plant-based foods, Pret opened two new Veggie Pret shops in London and the first Veggie Pret outside of London is due to open later in 2018. The second Veggie Pret shop opened this April in Shoreditch, selling items such as vegan macaroni cheese and chocolate brownies. In 2017 Pret opened their 500th shop and now operate across nine markets including Singapore and USA. Now over half of their range are vegetarian or vegan, with turmeric emerging as the most popular new ingredient in salads, sandwiches and juices. This year Pret was sold by Bridgepoint to JAB Holdings, which belongs to Germany’s Reimann family, descended by the people who would become consumer goods giant Reckitt Benckiser, and who were estimated by Forbes to be worth over $4bn each. As part of the deal, all Pret employees were gifted with £1000. 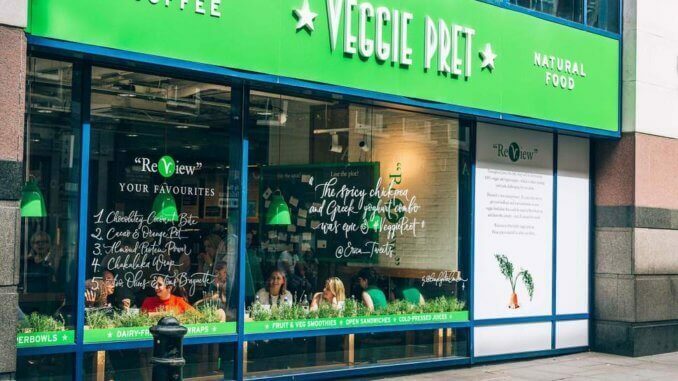 We look forward to seeing more vegan offerings from Pret as they continue to grow as a successful global franchise.